It’s science fair project season. Ask just about any parent, and they’ll tell you it’s more like torture season. In theory, science fair projects are a good idea. They provide good training for completing big project, step by step. Students learn about science. They also learn to pick an experiment that requires minimal effort and outside research. They should probably choose something involving food, and they shouldn’t ever depend on the weather. Plan ahead if your experiment involves growing anything or waiting on results. Growing mold takes weeks. Get ready to be resourceful. I don’t mind that my kids have a project to do. Science fair projects are so much, though. Here’s the real problem. I refuse to do my kids’ schoolwork for them. For a regular night of homework, this isn’t a big deal. Even a book report is manageable. My kids are pros at making posters. I might’ve made a few suggestions along the way, but my neat handwriting obsession doesn’t even take over. But science fair projects. This year might’ve seemed especially bad, because this was the first time we’ve had two going on at once. The Girl’s original plan backfired. She needed sunlight. We started over. The Boy came up with an idea, which was easily doable, but he’s a procrastinator. It runs in the family. It’s not that we’re underachievers. We’re realists. Neither kid seems interested in winning the science fair, or placing for that matter. After asking what they’re interested in doing for their projects, we help them formulate a plan. When The Boy suggested trying to prove something or other about the earth’s rotations around the sun, I promptly redirected him. I want him to shoot for the um, sun, but we don’t exactly have the resources. He said he wanted something to do with music and people and decided to see how music affects a person’s heart rate. She wanted something, anything to do with chocolate. She was willing to repeat The Boy’s project from last year. Now that I’m thinking about it, I should’ve let her. Shortcut unrealized. She settled on testing how long it takes hot chocolate to cool, before she could drink it. Sounds easy enough, right? If you’re the average person, yes. If you’re The Girl, and you drink warm drinks cooler than room temp, it’s a pretty lengthy and detailed data recording process. Her original procedure, which was already written in ink and copied for the poster, read that once the beginning temp and drinkable temps were established, temps were taken at one minute intervals until the hot chocolate reached said drinkable temp. Hot water, straight out of the Keurig, takes about fifteen minutes to cool to Girl’s Drinkable Temp. Multiply that times several rounds of testing (all in the name of science, obv), and the project took much longer than anticipated. Originally, the variable was a Styrofoam cup. We quickly switched to a wide soup bowl instead and rewrote the info for the poster. Sub 5 minutes for cooling in a wide soup bowl. Noted. On the last night, when we only had a “little to do,” we were keeping our supervisory sanity (barely), and The Girl mentioned how fun it was. I nearly choked on my Styrofoam cup of wine. Their projects aren’t perfect, but they’re finished. The lettering is slightly crooked. Construction paper borders have crappy scissor shredded edges. The handwriting is of varying size and shape. No real research was required, because the results aren’t all that scientific. Prize winnings are unlikely, but they’re done. Complete. Over until next year. Right when I was about to open my stupid mouth, The Girl started excitedly talking about her project. “I LOVE this poster, Mama. I think I did such a good job, and I can’t WAIT to show my class.” And that, my friends, is exactly why I hover just enough to provide guidance, but I never do their work. Seeing her pride was worth all of the frustration. The wine helped, too. 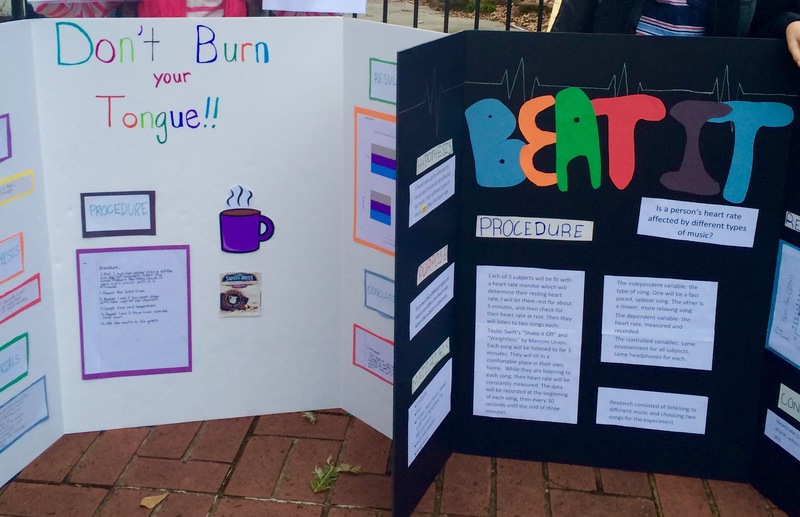 I still believe that all science fair projects come directly from hell. Oh, and to the lady at Publix who thought I was referring to my kids: I was talking about research and experiments and purposes and hypotheses. I wasn’t referring to my kids as the Devil’s work. 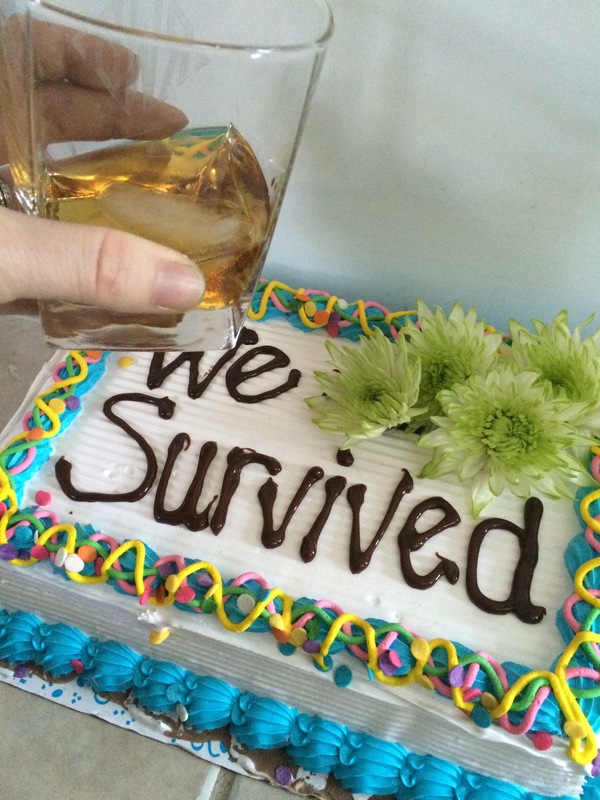 As a reward for our sacrifices, we had a surprise party today. Sure, the kids were surprised we were having it, but it was more like SURPRSE! EVERYONE IS ALIVE! ← a proposal! in real life! in a restaurant!